In March 2014, the Dunlap Institute for Astronomy & Astrophysics, University of Toronto, inaugurated the Dunlap Prize: an international award recognizing an individual whose remarkable achievements resonate with the Dunlap’s goals for excellence in astronomy and astrophysics. The Dunlap Institute was established in 2008 at U of T to be a global leader in sharing scientific discovery with the public, training the next generation of astronomers, and developing innovative astronomical instrumentation to enable breakthroughs in observational research. As a reflection of the Dunlap Institute’s commitment to public outreach and education, the first Dunlap Prize was awarded to renowned astrophysicist Neil deGrasse Tyson. 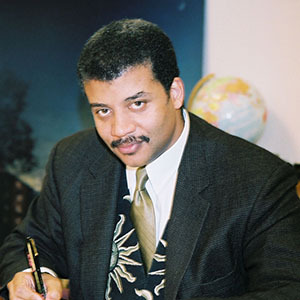 Dr. Tyson is an exceptional communicator, a prolific author and writer, was the host of PBS’s NOVA ScienceNOW, and currently hosts the popular StarTalk Radio podcast. He is the presenter of COSMOS : A Spacetime Odyssey, the follow-up to Carl Sagan’s Landmark television series. Dr. Tyson received his PhD in astrophysics from Columbia University and, following postdoctoral work at Princeton, became founding Chair of the Department of Astrophysics at the American Museum of Natural History in New York City. There, he was project scientist for the reconstruction of the Hayden Planetarium, where he is now Astrophysicist and Frederick P. Rose Director. The prize ceremony took place on Friday, March 21st, 2014, at the University of Toronto with invited guests in attendance.